FORT MEADE, Md. -- Bradley Manning is at the defense table. Casting a long shadow over his trial, however, is the figure of someone else the government would apparently like to put on trial: Julian Assange. On Tuesday, government prosecutors sparred with defense lawyers for Manning, the Army private first class who has admitted to leaking a massive cache of documents to the transparency organization that Assange founded. At issue was whether the judge should accept as evidence two WikiLeaks tweets and a crowdsourced document called "The Most Wanted Leaks of 2009." The lawyers' dispute was at times highly technical, but it could ultimately help decide the merits of a theory central to the government's case against Manning: that he should have known his leaks could wind up in the hands of Osama bin Laden. Manning was so reckless, the government argues, that he should be convicted of the most serious charge laid against him, aiding the enemy. In the course of making that argument, the government's prosecutors keep mentioning Assange's name. Over and over. So far in the trial, he has been referenced 22 times. "Manning is not charged with conspiracy," said Michael Ratner, a human rights lawyer representing Assange in the United States. So why, he asked, "is WikiLeaks being mentioned so frequently and so often?" "They seem to be at least planting in the public's mind that there's some agreement, conspiracy or aiding and abetting between WikiLeaks and Bradley Manning," he said. The prosecution presented forensic computer experts last week who tried to show that Manning gave WikiLeaks the airstrike video file. The WikiLeaks tweet, said prosecutor Captain Alexander von Elten on Tuesday, shows that the group was in "possession of stolen goods." "If WikiLeaks has a plan to compromise classified information, and Pfc. Manning is aware of that plan," von Elten said, that makes it "more likely that he knows what the effect of the compromise will be." Despite days of testimony from forensic witnesses about Manning's computer habits, however, the government has presented no evidence that Manning ever actually read either of the tweets (the other tweet asked for a list of US servicemembers' email addresses) or the "most wanted" list, only that he could have read them. Manning's defense argued the online files should not be introduced into evidence because they are nothing more than hearsay. "If you're going to talk about the effect on the listener, there has to be a listener," said Captain Joshua Tooman, one of Manning's lawyers. "The plan or state of mind of WikiLeaks has nothing to do with Pfc. Manning," Tooman said. "They can plan and do whatever they want. That doesn't affect Pfc. Manning." Col. Denise Lind, the military judge hearing the case, did not immediately rule on whether she will allow the tweets and the website into evidence. Even if she grants the defense its wish to exclude them, however, the government will have other files to fall back on. There are the chat logs between Manning and a contact the government purports -- but has not proved -- is Julian Assange. There is the Army Counterintelligence Center on WikiLeaks that Manning himself leaked, which the government says shows he should have known that the site could be used by terrorists. Taken together, said Eugene R. Fidell, lecturer in military law at Yale University School of Law, the government is trying to build "a collection of data points which [the prosecutors] think will permit the reader to the connect dots." "Whether the judge will buy what they're selling remains to be seen," he said. Fidell noted that any evidence entered against Manning will be of no value in any proceedings against Assange, holed up in the Ecuadorian Embassy in London for a year as of this week, if he is ever tried in the United States. For two years, prosecutors in the United States have held open a grand jury to investigate WikiLeaks and Assange for Manning's leaks. Manning's supporters say the government's apparent contention in both cases -- that someone can be prosecuted because they put information on the internet for anyone to read -- threatens the freedom of the press. On Tuesday, Assange told reporters that he will not leave the embassy even if Sweden drops its extradition request on sexual assault accusations, because he still fears the U.S. will seek to extradite him. "How can you doubt they're going after Julian Assange?" asked Ratner, Assange's U.S. lawyer. Ratner attended the opening statements of the trial on June 3, when the prosecution claimed that Assange helped Manning avoid detection on a classified government network. "There were so many mentions of Julian Assange and WikiLeaks it looked like they were the bull's eye of the case." 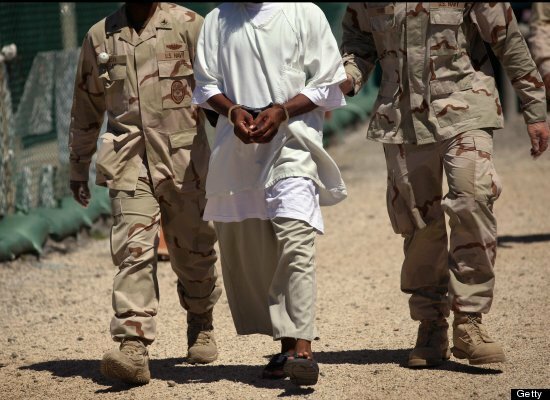 As the <em>New York Times </em><a href="http://www.nytimes.com/2011/04/25/world/guantanamo-files-lives-in-an-american-limbo.html?pagewanted=2&_r=1" target="_hplink">reports</a>, Mohammed Qahtani -- a Saudi believed to have been an intended participant in the Sept. 11 attacks -- was subject to coercive questioning and other abuses during his interrogation. The cables describe Qahtani as being leashed like a dog, sexually humiliated and forced to urinate on himself. His file says, "Although publicly released records allege detainee was subject to harsh interrogation techniques in the early stages of detention," his confessions "appear to be true and are corroborated in reporting from other sources."